Your birthday! Your anniversary! Your graduation! Your retirement! Your recovery! Your promotion! Your reunion! Your return from service! Your new baby! Your college acceptance! Your big win! Your engagement! Your honeymoon! Your new job! Those are just a few of the reasons people celebrate. And they’re also some of the reasons people celebrate at Walt Disney World. When I’ve answered questions for the Walt Disney World Moms Panel, one of the most frequently asked types of questions was, “I’m celebrating X event at Walt Disney World. What can I do to make it special?” So what’s the answer? How can you make a celebration special at Walt Disney World? 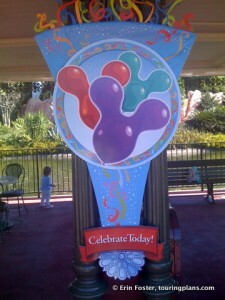 Please consider that you need not jump through any magical hoops to make a Disney celebration special. A trip to Walt Disney World is special all by itself. Space Mountain and a hug from Mickey! Seriously, life really can’t get much better than that. If you’re celebrating something for a child or a first-time guest, just walking through the front gates of the Magic Kingdom will make them feel on top of the world. Indeed, for a sensitive or easily overwhelmed youngster, a fancy to-do may be counterproductive, resulting in tears all around. Disney has long offered free buttons to guests as a way to publicly proclaim that they’re having a special day. These buttons are available at the guest relations offices at each park. Additionally, they often have a supply at the hotel check-in desks and at general ticket sales windows. (Please be aware that the free buttons are NOT the same thing as the for-purchase trading pins.) Buttons come in may styles and periodically change. Over the past 2-3 years I’ve seen: First Visit, Happy Birthday, I’m Celebrating (with a blank to fill in the occasion), Happy Anniversary, Family Reunion, Just Engaged, and Happily Ever After. These buttons don’t confer any special priorities, but they do let cast members and other guests know that you’re having a special day. You’ll likely get lots of extra smiles. 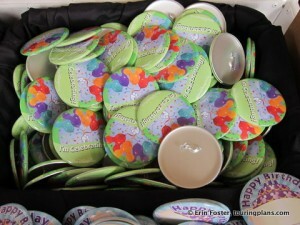 Tom Bricker gives more great insight into birthday buttons in the post Celebrating Your Birthday at Disney. If you want to take things up one notch further, you should make a point to tell EVERY cast member you encounter that it’s your special day, this includes cast you speak to when making room and dining reservations. Nothing is guaranteed (really, I mean it), but it’s not uncommon for birthday or anniversary celebrants to get small perks like free cupcake at dinner, a commemorative certificate, or a balloon in your room. IT’S NOT A PARTY WITHOUT A CAKE? Your first instinct when planning a celebration is to order a cake. If that’s what you want to do, Disney has a special hotline set up for just this purpose. A cake hotline. Why does this not exist in the real world? To order, call 407-827-CAKE (407-827-2253). Not to be a killjoy, but I’m going to ask you to think out of the box with me for a minute here and say maybe you don’t actually want or need a cake, even for a birthday. This goes double if you’re on the Disney Dining Plan. Here’s my thinking … First, there are desserts at Walt Disney World that are far more delicious and delightful than a plain old slab of cake. I’d rather have crepes from Chefs de France, ‘Smores from the ’50s Prime Time Diner, or the bread pudding at ‘Ohana. Slip your server a birthday candle and they’ll bring it out singing. Also, if you’re on the Dining Plan, your meal comes with dessert. Do you want cake on top of that? The answer may be yes, but I’m asking you to think about it. My point is, do something different. Try to conquer the Kitchen Sink at Beaches & Cream. Have Dole Whip for breakfast, lunch and dinner. Sample every kind of fudge at the Main Street Confectionery. The more off-the-wall your sweet treat is, the more your special someone will remember the celebration. This cake went uneaten. We were completely maxed out on dessert consumption. A great way to add oomph to your celebration is to decorate your hotel room. You can do this with streamers and balloons brought from home. When my family spent our first Christmas at Walt Disney World, I purchased several small artificial trees at Target, and we brought them on the trip and decorated them at the hotel together. If you’re not a do-it-yourselfer you can enlist the help of the Disney Floral and Gift Basket team. These dreammakers can be found online or at 407-WDW-GIFT. They have a number of room decorating packages available. They can also customize a basket for you. If you have something very specific in mind, get on the phone and speak to someone directly. Beyond these basics, the best way to “plus up” a Disney trip to make it a Disney celebration trip is to take an honest assessment of the person or event you’re celebrating. For example, my family celebrated my twins’ sixth birthday at Walt Disney World. At the time, the were relatively indifferent to many of the rides at WDW, but were completely obsessed with meeting the characters. 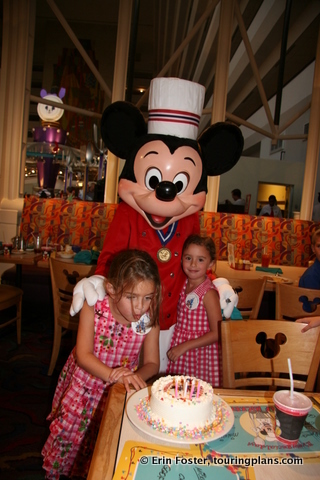 To make their day extra special, we booked not one, not two, but three character meals for that day: breakfast at the Crystal Palace, lunch at Cinderella’s Royal Table, and dinner at Chef Mickey’s. Obviously this was faaaar more food than we needed to consume, but it was the very best thing their first grade minds could imagine, so we indulged. And six years later, they still talk about it. Just because “women like spas,” or “men like sports,” doesn’t mean that’s what you should automatically turn to for your celebration. Take the time to talk with your special someone about what their wildest dreams are. If the celebration is meant to be a surprise, you can be oblique about this, or enlist a trusted friend to do some sleuthing for you. 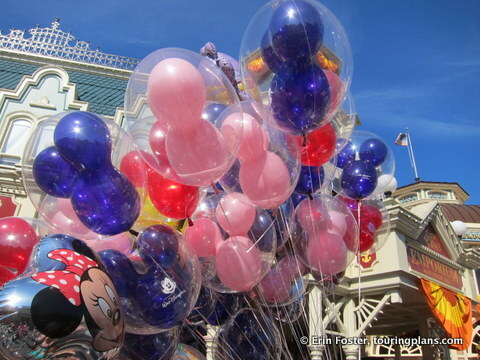 For example, if my husband sent me to a Disney spa for my birthday, I might feel awkward or uncomfortable, but if he brought me a bouquet of those fancy Mickey balloons they sell on Main Street (something I’ve always wanted but never had), I might possibly faint from bliss. This is truly at time when it’s the thought that counts. To get your thought process rolling, below are some ideas about activities you can add to your Walt Disney World vacation that will increase the celebration factor. Please note that while some of these ideas are quite expensive (tours, private events), many of them are inexpensive (personalized Mickey ears), or even free (watch Wishes from the beach). Take a horse-drawn carriage ride at Port Orleans or Fort Wilderness. Have the Disney Florist send two dozen red roses to your room. Book a dinner at the posh Victoria & Albert’s restaurant. Order in room service, then place the do-not-disturb sign on your door. Snuggle into an arcade photo booth for some mid-kiss portraits. 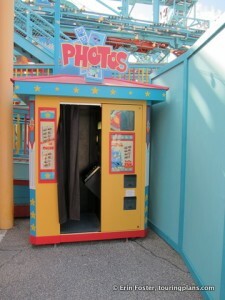 Win your sweetie a prize at Animal Kingdom’s Fossil Fun Games in DinoLand, U.S.A. Sit in the backseat of a car with a fancy drink and watch campy movie clips at the Sci-Fi Dine-In. Drop the kids at a Disney child-care center and sneak back to your room for some alone time. Arrange a vow renewal with Disney Weddings. Offer to let your sweetie sleep in, while you take the kiddos to the park. A romantic hiding spot at the Animal Kingdom. Drink around the World Showcase at Epcot. Spend a day at the Saratoga Springs Resort spa. Take a backstage tour at the Magic Kingdom. Book a suite or stay in a nicer resort than you usually do. Dine in a Signature Restaurant. 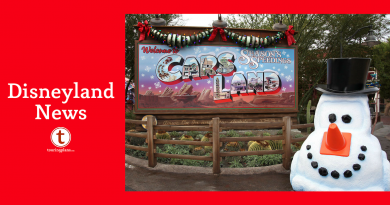 Create a special Touring Plan, using only the guest of honor’s favorite rides. Stay at the park until the very end. Go parasailing or waterskiing at the Contemporary. Get tickets to Cirque du Soleil’s La Nouba at Downtown Disney. Book three character meals in one day. Get a makeover at the Bibidi Bobbidi Boutique or the Pirate’s League. Go to the Downtown Disney AMC theater and let your child create the ultimate custom Coke Freestyle beverage. Go on a candy crawl through Epcot. Ride Space Mountain ten times in a row. Meet your child’s favorite character, every day of the trip. Have tea with Sleeping Beauty. 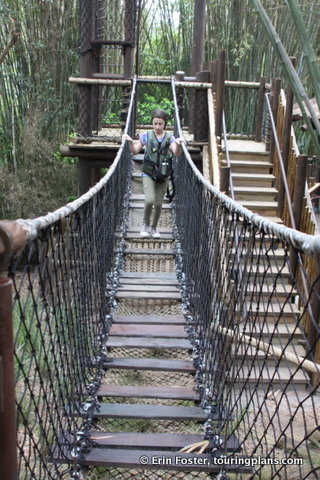 Take the Wild Africa Trek (one of the few backstage experiences open to children). Start a pin or Vinylmation collection and spend the trip trading. Let the child choose the day’s itinerary. Put a present under your child’s pillow to find when he wakes up. Host a party at Goofy’s Candy Company at Downtown Disney. Try to find all the hidden Mickeys at the Magic Kingdom. 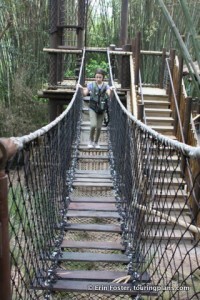 The Wild Africa Trek is great for kids. Go to the Hanes Design-A-Tee Store at Downtown Disney and get matching shirts for everyone. Have dinner at the Hoop Dee Doo Revue – the ultimate in festive dining. Arrange for a private IllumiNations dessert party. Get a private cabana at a resort pool or water park. Conquer the Kitchen Sink at Beaches & Cream. Have the ultimate mini-golf tournament. Spend a sing-along evening at Jellyrolls on the BoardWalk. They’ll play all your favorite songs. Get personalized Mickey Ears for the gang. Have a photopass photographer grab goofy shots of the entire group. Order and share the CD. Make a Disney “goody bag” for everyone in your group. Participate in a Run Disney race together. Create a Disney trivia scavenger hunt. Have a friendly competition among members of your group. What special celebrations have you had at Walt Disney World? What milestones have you marked in the parks? Have you found a unique or innovative way to celebrate? Let us know in the comments below. For our 10th wedding anniversary we brought along the cake topper & ordered a small cake. Just as you said, they were happy to use it for us. Supper was at Teppan Edo, so we surprised the other folks at our grill/table by sharing our dessert w/everyone (this was back in the day before the free dining plan). They were all tickled to get to have a free dessert & it was a fun way to celebrate. I decorated the hotel room while my wife was in the shower. The housekeeping folks got a kick out of that and added to it with towels. We also dined at Tokyo Dining, where my wife got to eat sushi and speak Japanese (something she seldom does) to the wait staff. These were simple but enjoyable things, and she got a free dessert at the restaurant (not all of them will do that). Rock on! I did the same thing—while my wife was in the shower I set out a stuffed Mickey that I bought from the Disney store in our home city and hid in my luggage. I’m more of a writer than a talker, so I wrote a love letter (it was our 1st anniversary) and put it in his big hands. I brought a gold glitter shaker from a craft store and shook it all around Mickey. :). Her reaction was priceless—shecouldn’t help but cry. We just got back from our trip, a belated (by two weeks) 13th anniversary celebration with the family. We spent our Honeymoon on the Disney Cruise and at Disney World, so we thought it would be fun to celebrate at Disney this year. I added that we were celebrating our anniversary to all of our dining reservations (6 total). We received acknowledgement from all but 1 restaurant (Ohana), California Grill and Crystal Palace gave us a special extra something. Cali Grill sprinkled our table with Mickey Mouse confetti, gave us a table next to the window overlooking the castle, and a special piece of chocolate with our dessert that said Happy Anniversary on it. At Crystal Palace, we received a cupcake and a special card signed by Pooh and all his friends. We enjoyed the extra special touches at Cali Grill, but the signed card by Pooh and friends really touched my heart.